March 04, 2018 at 11:24 am. 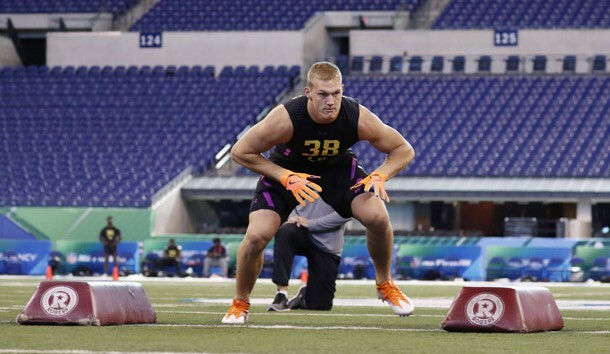 Leighton Vander Esch has gone from playing eight-man high school football in a tiny town in Idaho, to being a Boise State walk-on, to a one-year college wonder … to perhaps the first round of the NFL Draft. Vander Esch checked in at the NFL Combine at 6-foot-4 and 256 pounds, helping to solidify his rising status among scouts. After making only 26 tackles in 2016, he posted 141 stops in 2017, earning Mountain West Defensive Player of the Year honors. NFLDraftScout.com senior analyst Rob Rang lists Vander Esch as the No. 23 prospect on his Big Board and projects him as going at No. 28 to the Pittsburgh Steelers, who are looking for help at linebacker following the severe spinal cord injury that will keep Ryan Shazier out of the 2018 season. “He is a clear-cut NFL athlete with the size, awareness and reliable open-field tackling skills to be a long-time starter at linebacker,” Rang wrote. Vander Esch said he met with the Steelers at the Combine. Vander Esch, who played last season at 240 pounds, said he deliberately bulked up for the Combine. He was unofficially timed Sunday at 4.66 seconds and 4.67 seconds in his two attempts at the 40-yard dash, showing solid speed for a middle linebacker of his size. Not everyone is convinced Vander Esch, from Riggins, Idaho (population 419, he said), is first-round material, however. “If you watch his Oregon tape in the bowl, it’s as good an off-the-ball linebacker tape as I’ve seen in years,” NFL Network analyst Mike Mayock said.